Welcome to The Garden State Afghan Crochet A Long. 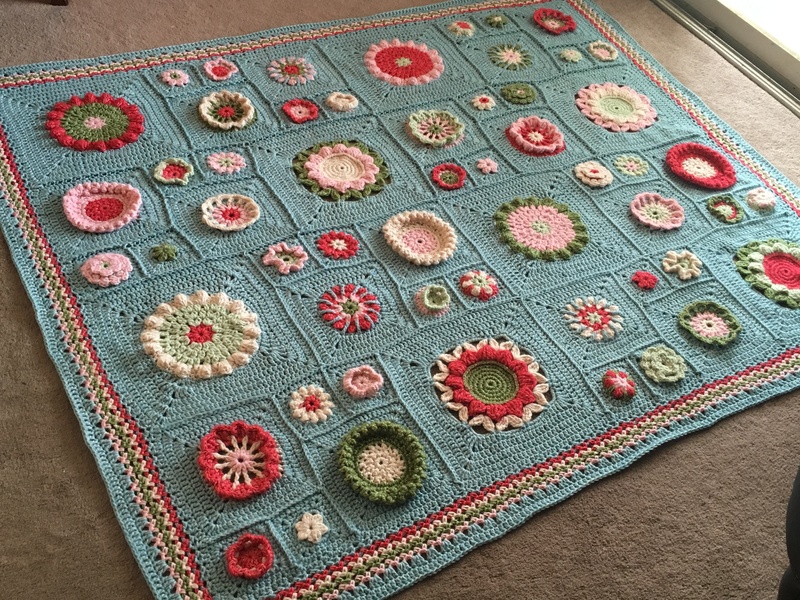 I designed this afghan in 2013 but recently made some minor changes and added a new border suggestion. The pattern will be released for free over a period of 8 weeks here on the blog and on Ravelry with coupon code #JULIEYEAGERGARDEN (expires June 30, 2016.) Please use #JULIEYEAGERGARDEN to tag your photos as well. 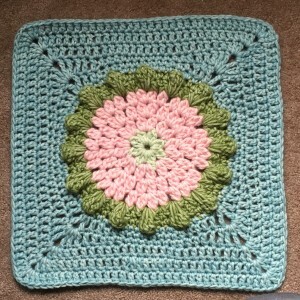 Please chat about the pattern on my Ravelry Board and on my Facebook CAL page. 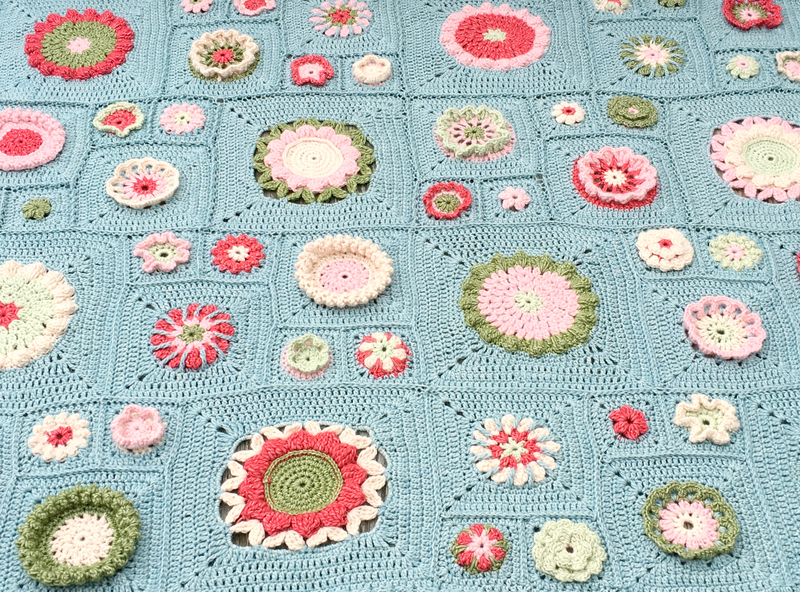 (If this link doesn’t work, please put “Crochet A Long with JulieAnny” in your Facebook search box.) We have over 6000 members and all are welcome! See all my designs in my Ravelry Store, Etsy shop, and on Loveknitting.com. Yarn Pack in the Suggested Scheepjes Stone Washed XL still available at Deramores. Thanks to Iris van Meer for her Dutch Translation of the pattern which you can follow on her blog and will also be available on Ravelry. 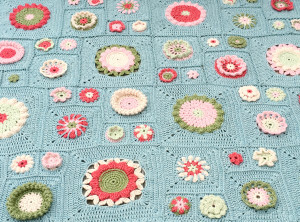 The Garden State Afghan reflects a profusion of flowers scattered across the grass. 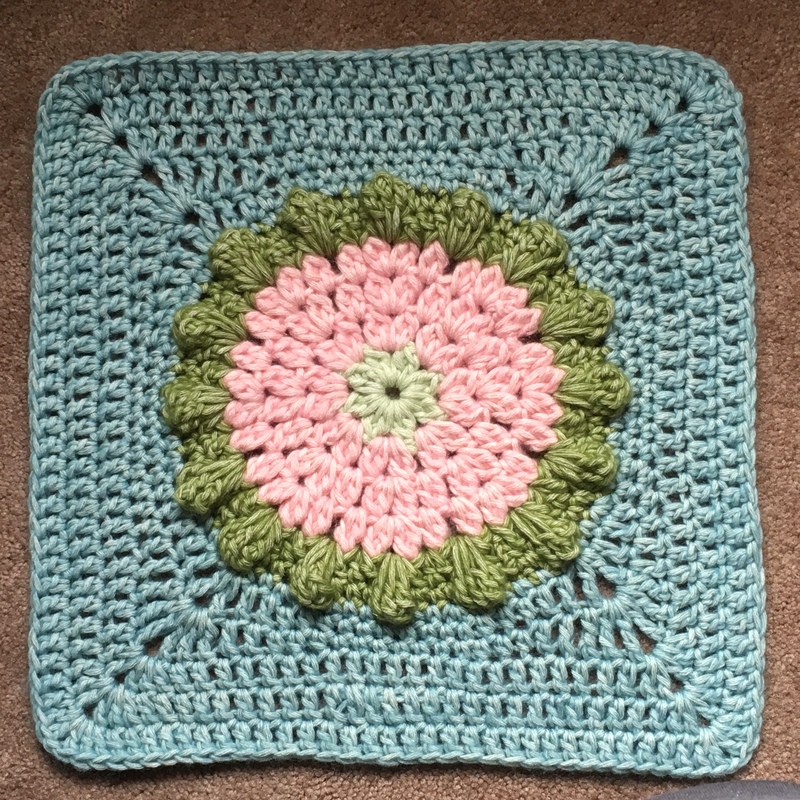 Constructed in three sizes of portable squares, crocheting your afghan will provide you with hours of enjoyment as you let your creative powers flow. There are 14 separate patterns, and each pattern is repeated four times. If you are using the suggested yarn, follow instructions for color changes, but if you are using stash and less concerned with amounts, just use Main Color (MC) when called for. Since the last revision, a few changes were made to help the blocks fit together more easily. Stitch counts are designed to fit together perfectly. Ch-3 at the beginning of a round counts as a dc; ch-4 at the beginning of a round counts as a tr, ch-2 at the beginning of a round counts as a hdc. Magic ring and standing stitches may be substituted per “crocheter’s choice.” Chains are counted as stitches in stitch counts. CL2 (Cluster of 2 stitches): (Dc in same st until last step leaving one loop on hook) twice, yo and pull through all three loops on hook. Fpdc (Front post double crochet): Insert hook from the front side of work from right to left around post of indicated stitch on a previous row, yo, pull up a loop and work dc as usual. Join new color with SC: Loop yarn on hook and insert into designated stitch. Yo and draw through, you have 2 loops on hook. Yo and draw through. You have joined the yarn with a sc. TR4CL – Treble Crochet Cluster with 4 trebles – (Tr in same st until last step leaving one loop on hook) four times, yo and pull through all 5 loops on hook. Round 6: Ch 1, sc in same st and in next st. (TR4CL in the space between two clusters below in Round 4, skipping and enclosing one stitch of Round 5, sc in next 3 st) x 16, omitting last 2 st. Sl st to first sc of round. Fasten off. (16 TR4CL, 48 sc) Push clusters to the front if needed. Yippee! The cal is starting! How long do we have to wait for the next pattern?! 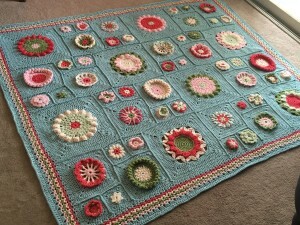 Thank you for the Wonderful Crochet Along! Glad you got it, Linda! Sorry for any confusion. I have bought colors to match my lounge suit & cushions. I want to label them A-E so that I have enough of each color…but I’m confused! Round 1 is with E – pink quartzite, which is a cream. ok. Round 2 says join B which is Canada Jade, the pic looks like Rose Quartz has been used. then Round 5 uses color D, but it looks like the Canada jade, which is labelled B. I know we can use any colors, but as I said, I don’t want to run out of a color. Thanks. and thanks for the fantastic pattern. You are so inventive! Hi, me again.I see it now!! I had a look at the finished item and see this pattern has been done in 4 different color ways……duh! Now I also get the contrast codes in brackets. thanks, Michele. Thanks Julie. They say the only dumb question is the one you dont ask! This may be helpful for others then, so I have done my good deed for the day!